The Corps’ lightning speed modernization effort to retool its forces for a bout with near-peer rivals is creating some hiccups in its force structure by spawning shortages in high-skill job sets and disparities in promotions. To address the issue, the Corps kicked off its first meeting Wednesday for a full officer and enlisted grade structure review: It’s the first comprehensive review in nearly 20 years, according to a forcewide message. “The purpose behind the Grade Structure Review is to correct grade pyramid imbalances that in some cases lead to changes in promotion timing or unintended inventory development challenges,” the MARADMIN reads. These imbalances cause chain reactions in promotions that can lead to an exhausted pool of lower rank-and-file Marines in various occupations and result in fewer senior leadership positions. 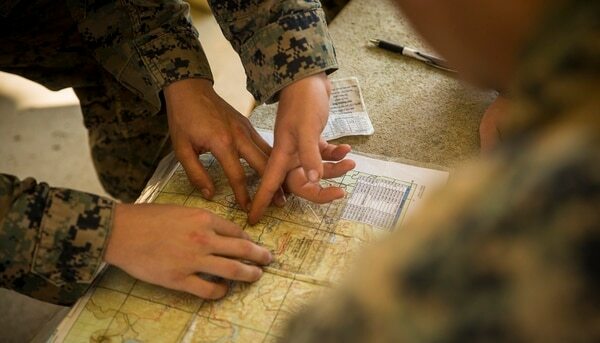 The Corps will be reviewing a series of high-demand and vital-skill jobs that have “imbalanced grade pyramids, specifically as a result of MCF 2025 implementation [Marine Corps Force 2025],” according to the MARADMIN. The priority jobs fields being reviewed by the Corps primarily fall in in the reconnaissance, intelligence, aviation and logistics side of the house. There will be two phases of the review, with the first spanning Sept. 26–Oct. 22 and the second from Oct. 26–Nov. 9. The Corps kicked off a smaller scoped review in 2014 focused on “cost savings through grade reduction of 6,000 officer and enlisted billets,” the MARADMIN stated. “The end state of the review is to improve inventory development in targeted PMOSs without degrading unit operational capabilities,” the MARADMIN reads. There are more Marines in power now than ever before. Here’s how it happened. For much of the Marine Corps’ history its top leaders have fought for a place at the table, having to elbow the larger services with much bigger budgets just to stay in the game. Lionhearted Marines had died in droves fighting during both World Wars, Korea and Vietnam. But in many eras, the smallest branch’s official role has been limited to the Navy’s maritime expeditionary arm, which has had to make do with less money, manpower and priorities as its sister services, which have long steered the military aspects of national security policy. But, now, for the first time, there are more Marines in top military and civilian positions at the highest levels of government. Right now a retired or uniformed Marine holds the seat of secretary of defense, White House chief of staff, chairman of the Joint Chiefs of Staff, head of Africa Command and incoming head of United States Central Command. The combined Army, Army Reserve and Army National Guard has more than 1 million uniformed members. It is twice the size of the Navy and has nearly two-thirds more people than the Air Force. The Marine Corps and its reserve component have about 220,000. There are five soldiers for every one Marine. So how did we get here? A close reading of the focus of key officers, performance in the past generation of warfare and the steps Marines took preceding 9/11 could provide some answers as to why Marines now are holding an outsized number of positions. Today, the Marines are on top. Secretary of Defense James Mattis and White House Chief of Staff John Kelly hold top positions of influence in both White House policy and defense department matters. Current Marine generals such as Chairman of the Joint Chiefs of Staff Gen. Joseph Dunford, AFRICOM commander Gen. Thomas Waldhauser and incoming CENTCOM commander Lt. Gen. Kenneth McKenzie Jr. lead top commands involved in active combat. Mattis recently nominated Marine Maj. Gen. George W. Smith Jr. for his third star and an assignment as his senior military assistant. Smith serves as special assistant to the director of the joint staff. Even the Brookings Institution, a leading D.C. think tank on foreign policy for more than a century, is being led by retired Marine Gen. John Allen. He’s the first Marine to serve as its president. There have been 218 active-duty Army four-star generals in its history, nearly 200 since World War II. The Marines didn’t even have a four-star general until the end of World War II. There have been about 50 active duty four-stars since. Ten of 14 commanders of CENTCOM have been Army generals since its inception in 1983. Before 9/11, Marines had commanded it twice. Now, with McKenzie’s nomination, they are now entering their fourth turn. Before 9/11 no Marine had ever commanded European Command. Similarly, only once before the terrorist attack had a Marine commanded Southern Command. The second was then-Gen. John Kelly. The Marine Corps didn’t hold a seat on the Joint Chiefs of Staff until 1978, nearly 30 years after it was created. The Corps didn’t chair the staff until 2005. Retired Army Gen. Barry McCaffrey, former commander of SOUTHCOM, sees the outsized role of Marines in leadership roles as an ‘uneasy’ situation, especially as the defense strategy under President Donald Trump shifts to great power competition. McCaffrey credited top Marine leaders with having unique talent and called Mattis, Dunford and Kelly some of the “finest public servants this country has ever produced.” He said the Marines’ development and management of senior officers put them in joint and nonstandard career track positions has helped them better compete for by-name nominations. By contrast, he said the Army has been wary of assigning officers to such paths. “To be honest it makes me uneasy to see the outcome,” McCaffrey wrote in an email to Marine Corps Times. He pointed to the Army as being the centerpiece of national security and an outsized Marine-centric thinking could hurt larger efforts. “For a decade we have been inadequately represented,” the four-star said of the Army. The Corps’ current position in high places may not continue, irrespective of national security priorities. Media outlets such as The New York Times have recently reported that both Mattis and Kelly are losing favor with President Donald Trump for several reasons including past disagreements and for alleged insults revealed in a book titled, “Fear: Trump in the White House,” by Bob Woodward, veteran journalist for the Washington Post. But Mattis recently told reporters that he isn’t going anywhere yet. And the Marine power-hold may continue. Despite successes in World War I and II, Marines found themselves in the late 1940s fighting for their very existence. The newly created Air Force, alongside the Army and Navy, was preparing for the growing Cold War with the Soviet Union and their roles in it. That fight imagined massed armies slugging it out on the plains of Europe, with a buildup of hundreds of thousands of U.S. soldiers on the continent. Or it envisioned trading barrages of nuclear weapons, first from air-centric bombing runs suited to the Air Force and then from the added nuclear submarine fleet and later from Intercontinental Ballistic Missiles, also controlled by the Air Force. The Marine Corps struggled as a bit player in that conversation. The Corps was seen more as a shock troop organization that could perhaps land in amphibious environments to achieve a small-scale objective as the Army gathered their strength for the real fight. But, in practice, Marines saw much of the actual engagements. As the Cold War wound down and America saw quick victory in the Persian Gulf War with a massive buildup that included scores of partner nations, top Marine Corps leaders were looking in a different direction, Shultz said. Shultz points to retired Gen. Charles Krulak, commandant of the Marine Corps from 1995-1999, as a driving force in setting up the service for post-9/11 success. In speech after speech, Krulak admonished leaders at the time to recognize that future wars would be fought on a much lower level and rapidly transition from direct combat to humanitarian aid. The flexibility built into the lowest ranks of Marine Corps units, coupled with what Schultz characterized as a premium put on education among the Marine officers, helped position the force for successes both on the battlefield and in D.C. The education portion he credits to retired Gen. Al Gray, commandant from 1987-1991, who established the commandant’s reading list and helped support Marines at all ranks focus on intellectual achievement. And Marines placement in high positions began shortly afterward. In 2005, Gen. Peter Pace was appointed the first-ever Marine chairman of the Joint Chiefs. That year, then-Secretary of Defense Donald Rumsfeld signed off on the creation of the Marine Corps Special Operations Command, bringing Marines to the joint special operations forces community after a quarter-century delay. That was followed by Mattis being appointed first as head of U.S. Joint Forces Command and then as commander of CENTCOM in 2010. In 2011, Allen took over as commander of International Security Assistance Force in Afghanistan. Three years later he served as the first Special Presidential Envoy for the Global Coalition to Counter the Islamic State of Iraq and the Levant. Some of the 1990s reorientation helped early in the Iraq War, Shultz said. He wrote a study titled, “The Marines Take Anbar: The Four-Year Fight against Al Qaeda.” The professor points out that while then Gen. David Petraeus was still drafting the Army field manual that would define counterinsurgency, or COIN, operations, Marines were already using such techniques as part of their campaign plan. Seeds planted by leaders going back to Gray, new organization such as the warfighting lab, and its concepts applied to help the service pivot to immediate military missions put it on solid footing when those exact types of missions dominated the post-9/11 landscape. 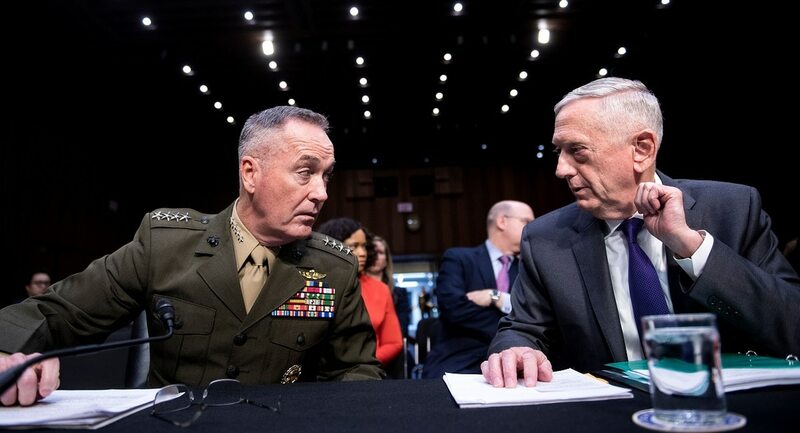 Successes by commanders and their units in those fights and positioning in joint roles likely helped leaders such as Mattis, Kelly, Allen, Dunford and others claim their seats at the table. CAMP PENDLETON – Sgt. Margarita Palli, an instructor at the Marine Combat Training Battalion, knew early on who her platoon standout would be. Palli was hiking mid-pack when she looked around to see how her Marines – new students in the 28-day course – were doing on the day’s 10K hike. There was exhaustion in their faces, heavy breathing and groans of pain as they lugged 60-plus-pound backpacks up a steep and dusty hill. “I saw this female and she was very stoic,” said Palli. “She just walked, no complaining, no nothing. I was like, ‘OK, I’m going to keep an eye on her.’” And she did. Durst, 26, of Reedsburg, Wis., was one of 58 females among a recent graduating class of 326 at Camp Pendleton’s Combat Training Battalion, finishing at the top of her class. She also is among 469 female Marines making history at Camp Pendleton as the first to take on combat training with their male counterparts at the Marine Corps base. They have gone through the combat course, which includes basic combat training, patrol and convoy, marksmanship using grenades and launchers and grueling 5-, 10- and 15K hikes through the hilly terrain that surrounds the seaside base. Of those 469 women, 406 have graduated. It’s a particularly significant milestone considering last week the Marine Corps marks 100 years of women in service. The shift has been evolving quickly since March, when Camp Pendleton’s School of Infantry West opened its historically male-only combat training battalion to women. For the first time in Marine Corps history, female Marines recruited from west of the Mississippi are training for combat at Camp Pendleton instead of at Marine Corps Recruit Depot Parris Island, S.C., where female Marines have traditionally been trained. Training at Camp Pendleton differs from that at Parris Island in climate and terrain. In South Carolina, Marines fight high humidity and bugs. Hikes are flat and circular. At Camp Pendleton, the terrain is rugged and Marines climb dry and dusty hills. The Marine Corps is the only military service branch to train all Marines to handle weapons and fight, regardless of their specialties. Female Marines train alongside men and are fully integrated at the platoon and squad levels. In boot camp, Marines are transformed through basic training from civilians into Marines. In combat training, they learn about war-fighting and develop a bond and warrior ethos that is part of the Marine Corps mystique. Lt. Col. Brian O’Shea, who trained with women when he entered the U.S. Navy in 1995, recently took command of the battalion. Males training with females, he said, won’t interrupt the nature of the training or the battalion’s timeline. What has changed since the ’90s, he said, is adding gear to fit typically female frames. Flak jackets are being designed for breasts; helmets are being made smaller; packs have retractable frames to prevent injuries to females’ backs and hips. In addition, housing, medical services and bathroom facilities have been added to accommodate females at the School of Infantry West. Before a recent combat training graduation parents, relatives and friends of Marines gathered in a building on the School of Infantry West campus to get a glimpse into what their Marines had gone through. Sgt. Major D. V. Velis Jr. gave a brief presentation. At the graduation ceremony, O’Shea called out Durst as the company’s honor graduate and presented a challenge coin in acknowledgment of her achievement. “In the last 29 days, one of you stood out more than the rest,” he said to Durst. Opportunities for female Marines began evolving significantly in 2013, when then-U.S. Secretary of Defense Leon Panetta lifted the ban on women in the infantry. By doing so, he overturned a 1994 Pentagon ruling preventing females from holding jobs in artillery, armor and other infantry specialties. Still, Marine Corps leaders sought to keep certain infantry and combat jobs closed to women, citing a 2015 gender-integrated task force study at Marine Corps Air Ground Combat Center Twentynine Palms. The study reported that some teams with women performed worse than all-male teams. But in January 2016, Secretary of Defense Ash Carter announced that all gender-based restrictions on military service were lifted, clearing the way for women to serve next to men in infantry roles. Three months later, Marine Corps officials announced all Marines would fall under the same policies. There are now 33 previously closed specialties open to female Marines, Bohm said. Over the past 12 months, in particular, there have been a series of glass ceiling-shattering events. In September 2017, Lt. Maria Hierl became the first to graduate from the grueling 13-week Marine Corps Infantry Officer Course and reported to the 1st Marine Division at Camp Pendleton. Hierl recently deployed with the 2nd Batttalion/4th Marines in support of Marine Rotational Force Darwin, becoming the first female infantry officer and platoon commander in Australia. There, she led 35 male Marines during combat exercises. 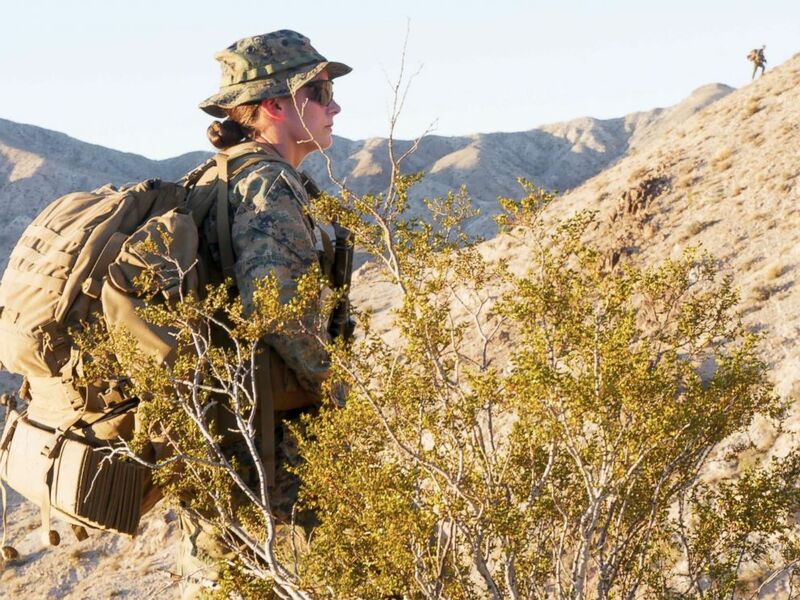 In October 2017, 2nd Lt. Mariah Klenke became the first female Marine to graduate from the Assault Amphibian Officer Course and was assigned to Camp Pendleton’s 3rd Assault Amphibian Battalion. About 8 percent of the 50,000-member 1st Marine Expeditionary Force, the fighting group based at Camp Pendleton, are women. Of those approximately 4,000 women, 332 serve at the 1st Marine Division, the ground combat element of the 1 MEF. Forty female Marines are serving in previously restricted combat jobs – such as machine gunner, mortarman, and field artillery cannoneer – at the 1st Marine Division. Marine Corps-wide, of the 184,473 service members, 15,885 are females, 80 of whom serve in combat roles. Sgt. Palli – a member of the Ground Combat Element Integrated Task Force that conducted gender-neutral training assessments – supports women in combat. “The only thing that concerns me is the physical aspect,” she said. As an example, Palli referenced a female Marine who wanted to be a mortarman, but needed a step-stool to reach the cannon. “I believe there should be certain weight and height requirements,” said Palli, who at 5-foot-5, 125 pounds, is the Marine Corps’ first female mortarman. Earlier this year, Palli was sent to Camp Pendleton to help with female integration. She is one of seven women in a group of 122 combat instructors. Palli’s first class was all male – when she got her first females, she noted many of them were more serious than the males about their training. Recently, when Pfc. Alicia Matias, 23, of Los Angeles, also a July graduate, said the men tended to be less mature than the women, Palli readily agreed. “You have 17- and 18-year-old boys and they see girls and they get immature,” she said. “But, they’re also very willing to help the girls. If anything, they actually try harder for the girls. It’s better for us because it’s a win-win situation. The girls also know how to shut them down.” For Durst, it wasn’t a gender issue. There was just something about her that made others in her platoon and squad respect her, Palli said. Taking her training seriously was definitely one element. Durst joined the Marine Corps in November. “I wanted to become a better version of myself and wasn’t living up to my expectations,” she said, adding that she managed a gym and coached the Badger Lightning girls youth hockey team in her small Wisconsin farming town. Durst’s brother had joined the Marines and when he returned home on leave, she recalled, he had been transformed. He had become a Reconnaissance Marine. “When I first saw him, he whispered in my ear that I should join the Marines,” she said. “He told me I’d like the leadership aspect. He sold me and I contacted his recruiter.” Once in, the 5-foot-8 Durst loved the physical challenges that boot camp presented. She particularly enjoyed hiking the hills. What surprised Palli was the reaction of the male Marines to Durst’s honor. (Marine Corps Times) The Corps is once again dishing out $5,000 bonuses to recruits who sign up to go infantry for six years.